Regional Art Exhibit held each year at the Wilson Gallery at the Merrilat Centre for the Arts at Huntington University. The show is sponsored by the Lafontaine Arts Council. 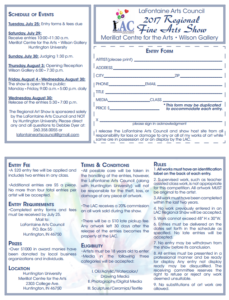 Entry forms for the open show can be requested by calling Debbie Dyer at 260.358.0055, email her at lafontaineartscouncil@gmail.com, or can be found here or on Facebook. Any inquiries regarding the show should be directed to the Lafontaine Arts Council. Entry forms are due no later than Tuesday, July 25. Art entries will be received on Saturday, July 29, from 10-11:30 A.M. at the Merrilat Centre for the Arts at Huntington University. The opening reception will take place on Thursday, August 3rd, from 6-7:30 P.M. at the Wilson Gallery in the Merillat Centre for the Arts at Huntington University. The show will be open to the public beginning August 4 through August 30. Gallery hours are 9:00-5:00 Monday-Friday. Entries will be released Wednesday, August 30th from 5-7:30 p.m.